HOLGUIN, Cuba (CNN) -- Sunday was a day of commemoration in Cuba -- the 56th anniversary of the start of the Cuban Revolution -- but the message from President Raul Castro was not all celebratory. 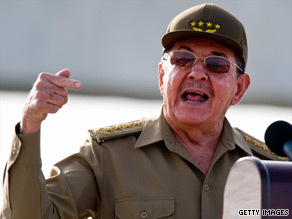 President Raul Castro tells the Revolution Day crowd, "The land is there, waiting for our sweat." The island nation will face a second round of belt-tightening as a result of the global financial crunch, Castro said in a speech marking Revolution Day. He said that on Tuesday he would hold a meeting of the Council of Ministries "dedicated to the analysis of the second cost adjustment in this year's plan, due to the effects of the global economic crisis, especially on the reduction of revenues from exports and the additional restrictions on accessing external financing." The global economic downturn has hit Cuba hard. Revenues from key exports like nickel are down. The price of imports, like food, is up. Castro said he would also meet with the central committee of the Communist Party this week to discuss the situation. Any proposed cuts will affect a Cuban population already feeling the squeeze. Public transport has been reduced as part of austerity measures. The government has ordered factories and businesses to cut energy consumption or face sanctions. Castro took a few swipes at the U.S. trade embargo that has been in place since 1962, but made it clear Cubans have only themselves to blame for agriculture shortages. "The land is there. We Cubans are here. We'll see if we get to work or not, if we produce or not, if we keep our words or not," he said, pounding his fist on the podium. "It's not just a question of shouting 'fatherland or death, down with imperialism, the blockade knocks us out' when the land is there, waiting for our sweat." Cuba has seen hard times before and has always worked to pull through, Castro said in front of the 200,000 people packed into the parade grounds of Holguin, about 500 miles southeast of Havana.